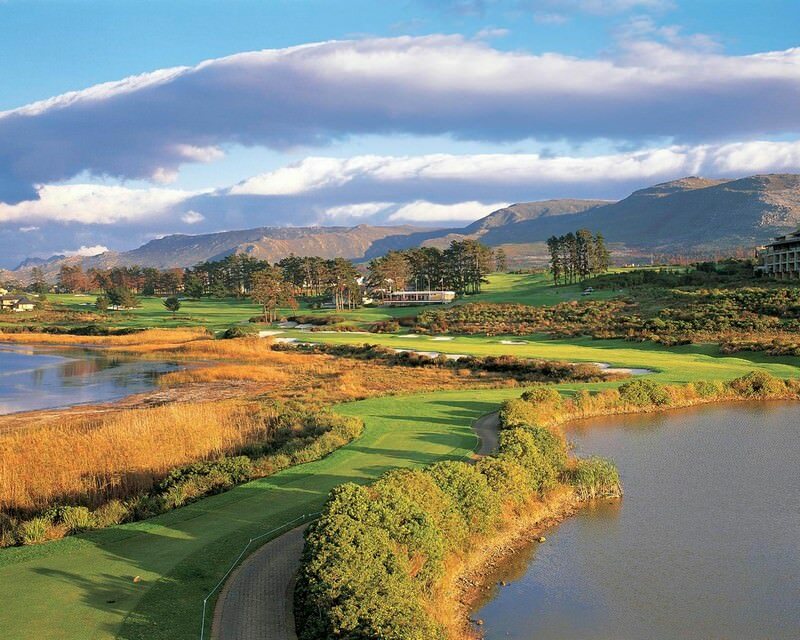 Arabella Golf Course is enhanced by the breathtaking beauty of the coastal Overberg. 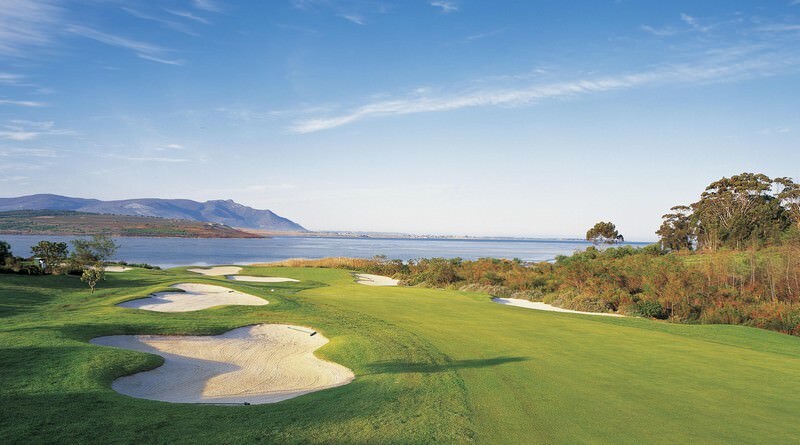 The award-winning Arabella Golf Course and Country Club enjoys an inimitable location near the seaside town of Kleinmond, ensconced beneath the meandering gaze of the Kogelberg mountain range. 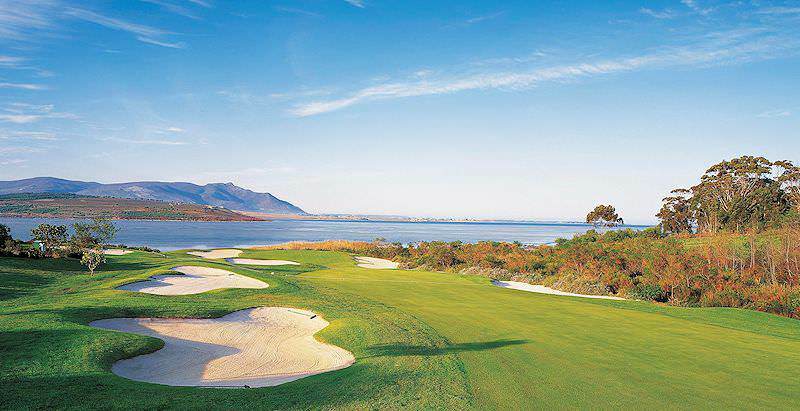 The dominant-Bent greens and sprawling Kikuyu fairways are fringed by wild fynbos and contoured by the azure waters of the Western Cape’s Bot River Lagoon. Every hole is enhanced by these striking natural panoramas and peppered with testing bunkers and water hazards. Designed by the esteemed course architect Peter Matkovich, this 18-hole Par 72 course rolls over 6391m of prime coastal estate, combining Links and Parkland-style miens. Arabella Golf Course currently ranks #5 on Golf Digest’s list of the Top 10 Golf Courses in South Africa and boasts numerous other accolades and awards. Its 8th hole has been pronounced as one of the most handsome par-5s in the country, while the 18th holds rank as one of the finest finishing holes. 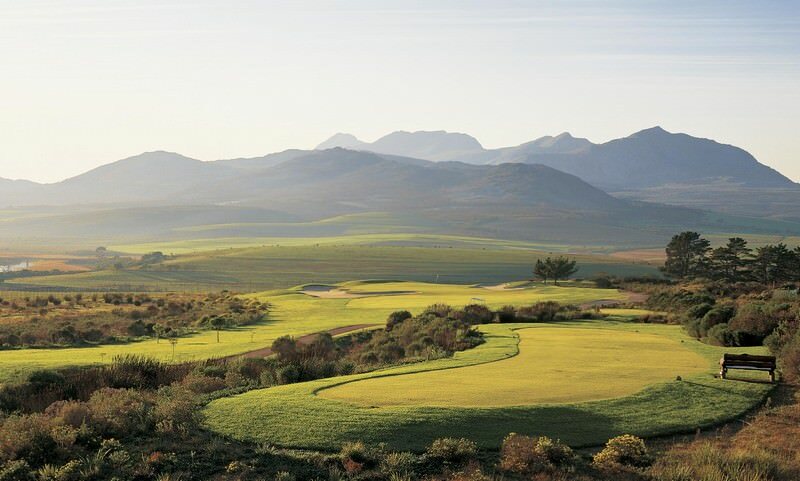 Many revered industry professionals and celebrities have appreciated an Arabella golfing experience, from Jack Nicklaus and Retief Goosen to Samuel L Jackson and Ronan Keating. Arabella’s location in the coastal Overberg region makes it an ideal addition to a relaxing seaside holiday. Augment your holiday retreat when visiting this lauded resort in the late winter or early spring months by including a whale watching experience. Walker Bay is visited by hundreds of marine giants during this period, particularly southern right whale. Travel to Botswana for the safari experience that dreams are made of. Namibia is a sprawling desert country that shares a coast with the Atlantic Ocean. Travel to Zambia for unadulterated wilderness and ample wildlife. Zimbabwe's view of the world-renowned Victoria Falls is breathtaking. The Greater Kruger National Park is a sprawling wilderness that stretches over two provinces in South Africa. The Sabi Sand Private Game Reserve offers truly rewarding sightings of the Big Five and a wealth of other animals. The Cape Town tours offered by African Sky are 100% private, expertly guided experiences that are truly immersive. The Garden Route is a spectacular stretch of coast that offers a wealth of adventures, from bungee jumping to dolphin watching.